The lovely people at Taf Toys kindly sent us a generous selection of their baby developmental toys when Hugo arrived. Over the months we have been putting the toys through their paces and learning more and more about the brand. 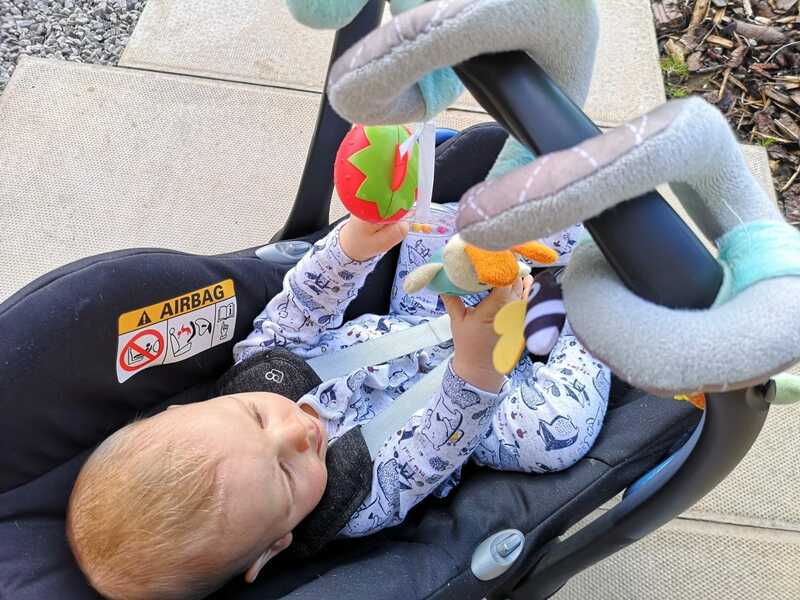 I’ve been really impressed with the range of toys we have previously reviewed, and this month we are talking about two beautiful toys that make driving with your baby easier and fun. We have been using the North Pole Feet Fun Car Toy and the Garden Spiral! Driving with a baby can be challenging as your main focus has to be on the road ahead. 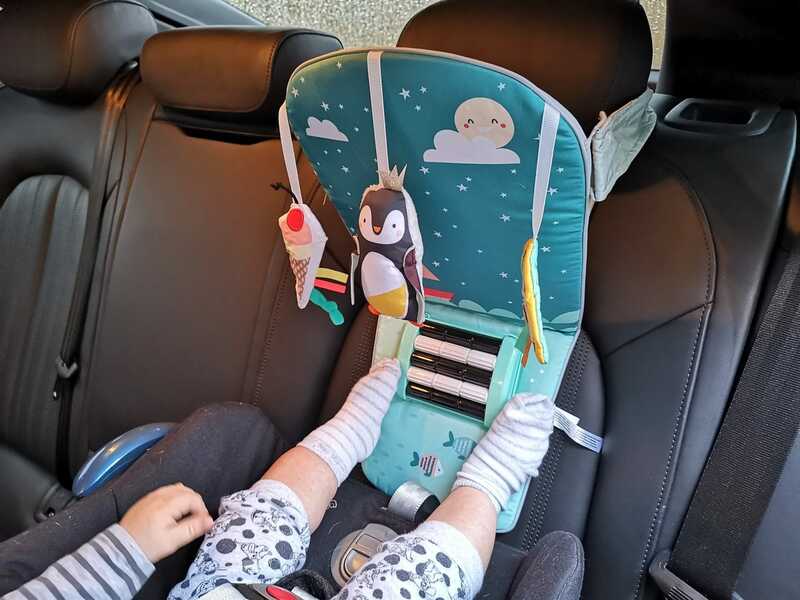 Car journeys aren’t exactly the most riveting experience for a baby so giving them something to help stimulate them can keep them content while you are on the road. I have previously tried giving Hugo toys to play with which at first work brilliantly. What I have found though is toys are easily dropped which can actually cause great frustration which isn’t ideal. The North Pole Feet Fun Activity Toy fro Taf Toys is a great stimulating and entertaining g toy that eliminates that frustration. The toy goes with a rear facing car seat which is what is recommended for babies. There are plastic rings which attach to the seat headrest, and the Velcro straps help adjust the angle and height of the toy so that you can position it correctly. Hugo is a big fan of the foot stimulation feature which adds an additional element to the toy. It encourages him to move his feet as well as his hands. The attached soft toys are bright and engaging. There is a penguin that rattles, an ice cream that crinkles and a baby safe rainbow mirror. Since using the North Pole, Feet Fun Car Toy car journeys have been much more relaxed. I often hear Hugo, and he only goes quiet when he has fallen to sleep! 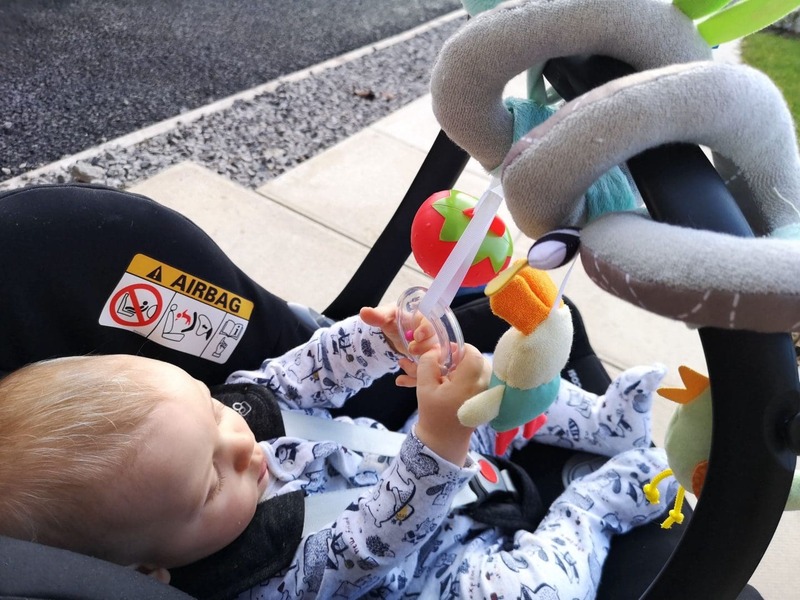 This soft spiral wraps around Hugo’s car seat handle creating a mini activity centre for on the go. This has been my ultimate saviour on many occasions when I have had boring hospital appointments or GP visits. The attached toys rattle and jingle, and there is even a handy soother storage case connected. 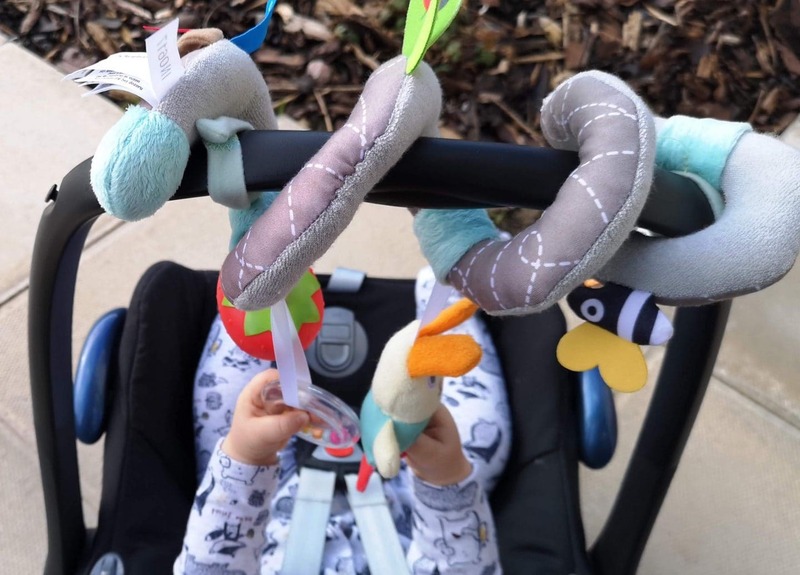 Since the toy is attached to the arm of the car seat, it means there is no risk of toys being dropped and lost while out and about. Hugo is really captivated by the Garden Spiral, and he is often reaching out with his hands and feet to try and touch the attached toys. This is really helping his motor skills while stimulating his senses. As a parent, both of these toys have really helped ease the stress associated with time in the car seat. 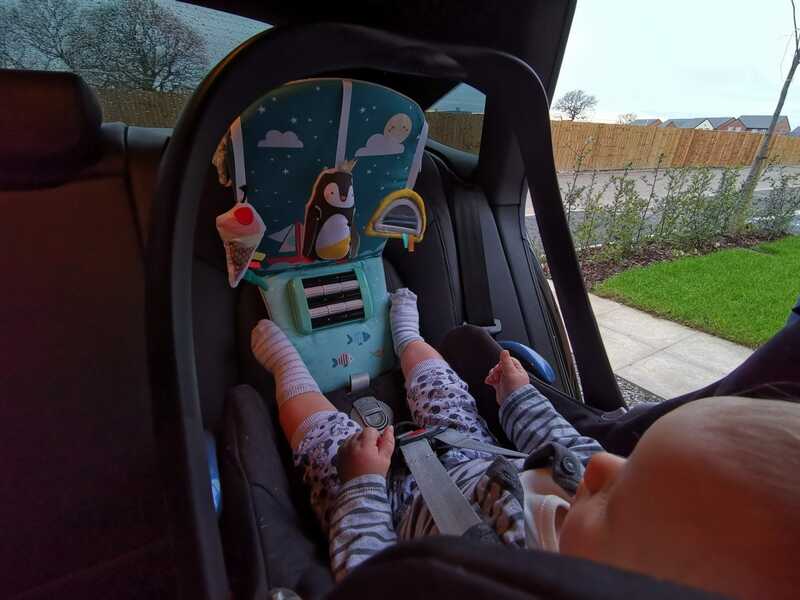 Whether Hugo is in the car playing with the North Pole Feet Fun Car Toy or on the go admiring the Garden Spiral, he is focused and stimulated for longer meaning that I can concentrate on things like the road! I think it’s safe to safe Hugo is a big fan of both toys! The North Pole Feet Fun Car Toy costs around £27.99, and you can find out more and purchase your own from *Amazon, Debenhams or Boots. The Garden Spiral costs around £20.00. Find out more and purchase from *Amazon. I received these items on a gifting basis in return for an honest review because of this I have marked this post as an AD. I did not receive payment or bribe and as always all words, opinions, and views are honest and my own. Links marked with * are affiliate links this does not cost you anything. For more information on any of this please head over to this page.